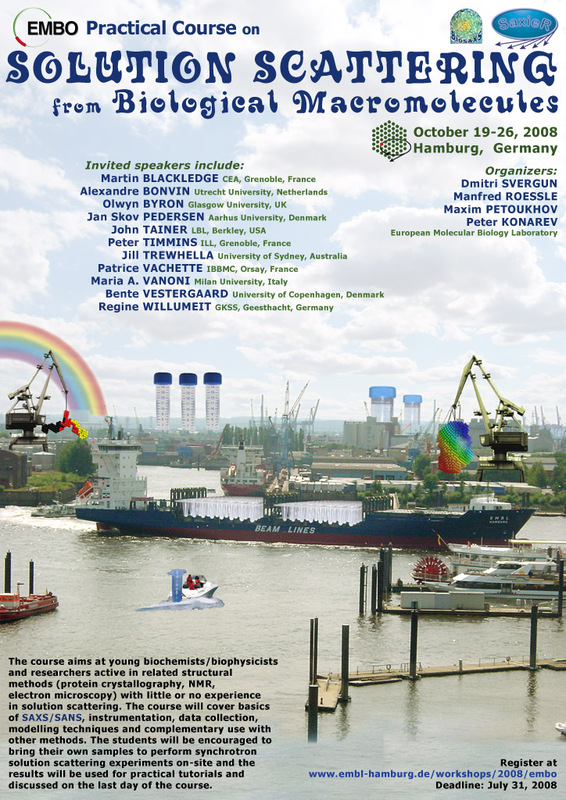 The course will take place at EMBL Hamburg from October 19 to 26, 2008. 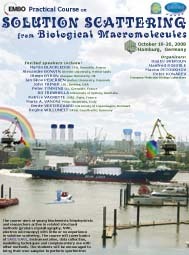 The course aims at young biochemists/biophysicists and researchers active in related structural methods (protein crystallography, NMR, electron microscopy) with little or no experience in solution scattering. The course will cover basics of SAXS/SANS, instrumentation, data collection, modelling techniques and complementary use with other methods. The students will be encouraged to bring their own samples to perform synchrotron solution scattering experiments on-site and the results will be used for practical tutorials and discussed on the last day of the course. There is no registration fee and accommodation and subsistence are covered for accepted applicants. Scientists from industry will be required to pay a fee of Euro 1000. Limited travel support could be provided to young scientists working in geographical Europe with the exception of Germany, UK, France, Spain, Italy, Norway, Sweden, Denmark, Finland, Switzerland, Austria, Netherlands, Belgium and Ireland. The deadline for applications is July 31, 2008. The applications will be considered by a Selection Committee and the results of the selection procedure will be sent to applicants by E-mail within about four weeks of the closing date. This EMBO course is also supported by an EU Design Study SAXIER.